Long-run returns, in banking as in other industries, are affected by competitive forces and evolving business models, not input prices directly. Indeed, in countries such as Denmark with aggressively negative interest rate policies, some banks have increased returns-on-equity as net interest margins have declined and capital ratios improved. Danske Bank, for example, raised its ROE to 11.6% in 2015 from 8.6% in 2014 even as the net interest margin declined 10bps to 1.35% following the Central Bank’s reduction in a key policy rate to -0.75% early in the year. The competitive impact of NIRP could be to increase the threat of cash as a substitute for bank accounts if negative rates were imposed on retail depositors; it is therefore not surprising that industry-leaders have chosen not to do this (although NIRP costs are more fully passed on to institutional clients). 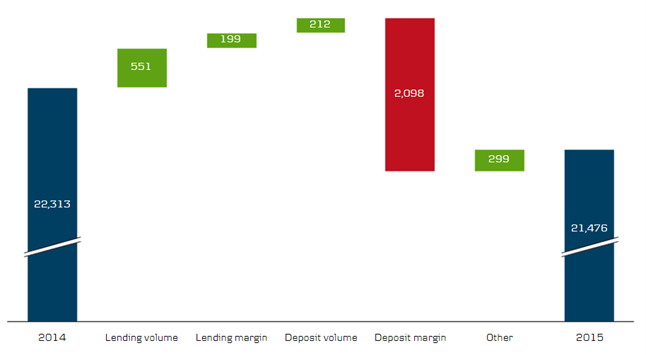 Rather, Danske has compensated for declining deposit margins with wider lending margins (even if some consumers have been able to obtain loans with negative rates), increased fee-intensity, and improved efficiency. In the US, the advantage from improving fee-intensity and efficiency in a lower-for-longer rate environment will favor large banks deriving more than 50% of total revenue (versus ~40% for regional banks) from non-interest sources and able to bid aggressively for new retail accounts, even at low deposit margins, because of a broader offering of loan products (such as credit card and mortgage) and wealth management products. Furthermore, investors under-appreciate the offset to lower rates from improved efficiency ratios as consumers migrate to digital channels where large banks are advantaged by the shift from the variable costs of branches/tellers to the more fixed costs of investment in mobile platforms at scale. Scandinavian banks are in the vanguard because of higher mobile broadband penetration (with over 3G/4G mobile connections over 120% of the population versus less than 100% in the US) and have driven efficiency ratios below 50% in the case of Danske Bank in Denmark and to near 40% in the case of DNB Bank in Norway. In contrast, the efficiency ratio for BAC’s consumer bank is 57%, but we expect the gap to narrow with that in mobile broadband penetration. BAC continues to be our top pick among US bank stocks. Earlier this month, Danske Bank reported a 2015 ROE of 11.6%, up from 8.6% in 2014 despite deleveraging, and announced a 2016 buyback of DK 9bn representing ~5% of current market cap (in turn representing a 20% premium to book value). None of this would be a particularly remarkable except that Denmark pioneered negative-interest rate policy (NIRP) in July 2012 and, in 2015, was the most aggressive practitioner with its key policy rate now at -0.65% after being increased 10bps on January 7th, 2016 (Exhibit 1). Denmark’s key policy rate is -0.65%, raised 10bps on January 7th 2016 but nonetheless aggressively negative as the Central Bank, Danmark’s Nationalbank (DN), defends a krone/euro exchange band (+/- 2.25% to 7.46038 DKK/EUR), in place since the euro was created (and, indeed, before then since 1982 via a DM peg), by buying euro. Governor Lars Rohde is emphatically resolute: “there is no upper limit to the size of the foreign exchange reserve … the sole purpose of monetary policy instruments is maintaining a stable krone exchange rate against the euro”. Denmark was the first European nation to adopt meaningfully negative rates setting its policy rate at -0.2% in July 2012 to defend the krone peg but raising the rate over time until it returned to positive territory at 0.05% in April 2014. However, the rate was cut below zero again, to -0.2% in November 2014 as the ECB responded to deflation risk by purchasing asset-backed securities and indicated willingness to extend “quantitative easing” to sovereign bonds. DN cut the rate three more times to a low of -0.75% on February 6th 2015 as Switzerland abandoned its peg on January 15th and the ECB began buying sovereign bonds in March 2015. Danish bankers comment that dealing with NIRP is like “learning to drive a car backwards” as consumers can obtain loans with negative interest rates and net interest income has declined meaningfully even as higher loan margins and lower funding costs in the wholesale market are swamped by the decline in deposit margins as Danske has not imposed negative rates on consumers for fear of cash-hoarding (although it does pass NIRP costs fully onto institutional clients and partially onto SME clients). However, Danske has improved its ROE before goodwill impairments through a ~5% increase in non-interest revenue (accounting for ~50% of total revenue) and ~5% reduction in non-interest expenses. Even if you exclude the credit benefit (and you should not since lower rates improve credit performance), the 2015 ROE would have been 10.3% versus the reported 11.6% and 8.6% in 2014. This is no coincidence: Danske Bank has made non-interest revenue a strategic priority including announcing a new wealth management unit for April 2016 and has been a first-mover in digital channels (reducing branches by 50% since 2012) as a structural driver of improved customer experience and lower costs. Indeed, in our note of January 2nd this year, we commented that Scandinavian banks are in the vanguard of moving customers to digital channels and hence improving efficiency ratios to near 40% in the exceptional case of DNB Bank in Norway (Exhibit 2). 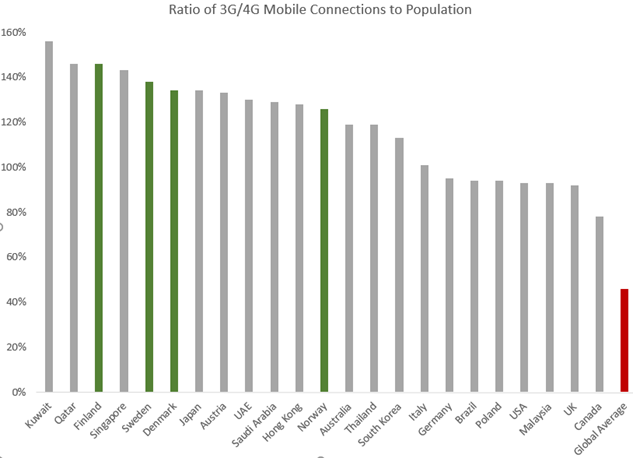 In part, this is because Scandinavian countries have leading mobile broadband ratings with 3G/4G connections at well over 120% of the population compared with less than 100% in the US (Exhibit 3). As the US catches up in mobile broadband connectivity, we expect the efficiency ratios for US banks to follow suit so that cost improvement will provide a meaningful offset to lower-for-longer rates and hence margins.